The Countdown Begins. AMC released today a new trailer previewing its highly anticipated new scripted drama, Turn, starring Jamie Bell, which debuts with a 90-minute premiere on Sunday, April 6 at 9 PM ET. Turn is a layered, character-driven spy thriller set during the American Revolutionary War. Based on remarkable new research featured in the book "Washington's Spies," by Alexander Rose, the untold story of America's first spies has finally been decoded and declassified. 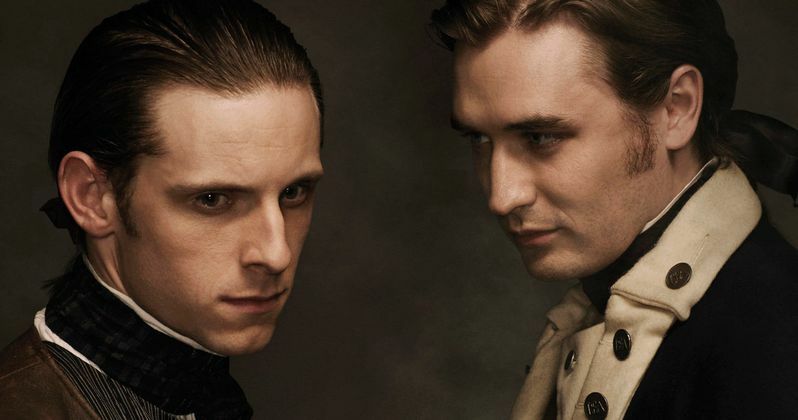 Turn tells the tale of Abe Woodhull (Jamie Bell), a farmer living behind enemy lines in British-occupied Long Island, who bands together with a group of childhood friends to form The Culper Ring, an unlikely team of secret agents who would help turn the tide of the war in favor of the Rebels. Their daring efforts also revolutionized the art of espionage, giving birth to modern tradecraft as we know it today, along with all of the moral complexity that entails. A vibrant story with contemporary significance, Turn turns history into suspenseful and resonant entertainment. Turn, from AMC Studios, was developed and written by Craig Silverstein (Nikita) who also serves as series showrunner. The pilot was directed by Rupert Wyatt (Rise of the Planet of the Apes). Barry Josephson (Bones, Enchanted) from Josephson Entertainment is executive producer. The series stars Jamie Bell (Billy Elliot, King Kong, The Adventures of Tintin) as Abraham Woodhull, Seth Numrich (The Good Wife) as Ben Talmadge, Daniel Henshall (The Snowtown Murders) as Caleb, Heather Lind (Boardwalk Empire) as Anna Strong, Meegan Warner as Mary Woodhull, Kevin McNally (Pirates of the Caribbean: On Stranger Tides) as Judge Richard Woodhull, Burn Gorman (The Dark Knight Rises) as Major Hewlett, Angus Macfadyen (Braveheart) as Robert Rogers, JJ Feild (Captain America: The First Avenger) as Major John Andre and Samuel Roukin (Harry Potter and the Deathly Hallows - Part 1) as Captain Simcoe.